Search the Community: Showing results for tags 'mega man'. MMBN3 White Randomizer I found the original MMBN3 White Randomizer a while ago and decided to tweak it to make things more interesting. Here's the list of changes: Removed the VarSwrd damage penalty (Was 60, now it's back to its default of 160). Added the ability to change all Battle Chip and Program Advance damage values directly with text files. Added the ability to change Virus and Navi HP directly with text files, though I don't have their names listed anywhere, so good luck with that. Added Game Modifiers to play around with Chip Damage/Enemy HP Multipler and Variance values Chip Roulette Modes Added the ability to type in a Seed for the randomizer. It also saves whatever seed you use to a new file for sharing purposes. If you don't supply a seed, it generates one. These are all explained in the included NOTES.txt. Credit goes to Samfin, Prof.9, and Rockman.exe for the original program, and myself for the tweaks. NOTE: This requires Python 2.7 in order to use it without issues. I tried porting it over to 3.3, it was a headache to figure out so I just reverted those changes. Also, I'm no super-genius of a programmer, so don't expect any updates to this from me. As much as I would've like to modify other aspects, I'm just not smart enough to. If you're wondering how I figured out all of this, I used a Hex Editor and notes I found on a major Mega Man Battle Network site, as well as some Python help resources. 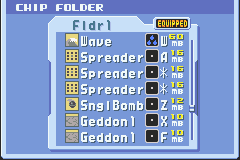 Known Issues: Jelly Viruses, specifically their wave attack, will crash some emulators while creating sprites in other emulators. I'm not sure if this is an emulator-specific issue or something to do with the ramdomizer. It also will only crash/create sprites when hitting Rocks or Mega Man, not Rooks. Prisms might also be unaffected, though unsure. Testing the randomized roms on console with a low-grade flash cart produces the sprites, but doesn't crash the game, so I'm thinking this might just be something the randomizer does that emulators pick up poorly. I'm also unsure if they're due to my changes or not. Snipe'd the problem and fixed it. None that I've noticed, but feel free to post any!